This is a completely customized Chicago Cubs, White Sox and Blackhawks theme wedding cake topper ordered by one of our customers. They are Chicago Blackhawks fans in common, and groom is still a Chicago Cubs fan and bride is a Chicago White Sox fan. So they would like to involve the three teams in their wedding. The groom would like to be in his black tuxedo, wearing a cubs baseball cap. The bride would like the White Sox logo somewhere on the dress and a veil in the back of her head. After checking her gorgeous dress, we placed the logo on the right middle of her dress, next to her waist. It turns to be an excellent placement. We got a problem when we try to involve Chicago Blackhawks in their cake topper. They wanted to add a Blackhawks hockey puck in-between them sitting on the base in their original plan. However the Blackhawks head is too complicated, that would be really hard to figurine out the whole head if do as they said. So we recommended making the whole base as a Blackhawks hockey puck and moving the Hawks head forward a little bit to avoid covering by the figurine and dress. Also we drew two drafts to give them a comparison of the two designs (as showed in Draft-3 and Final draft). Finally they followed our suggestion and the final product looks really beautiful. 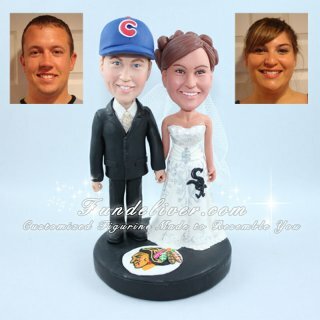 How do you think about this Chicago Blackhawks wedding cake toppers, cute? 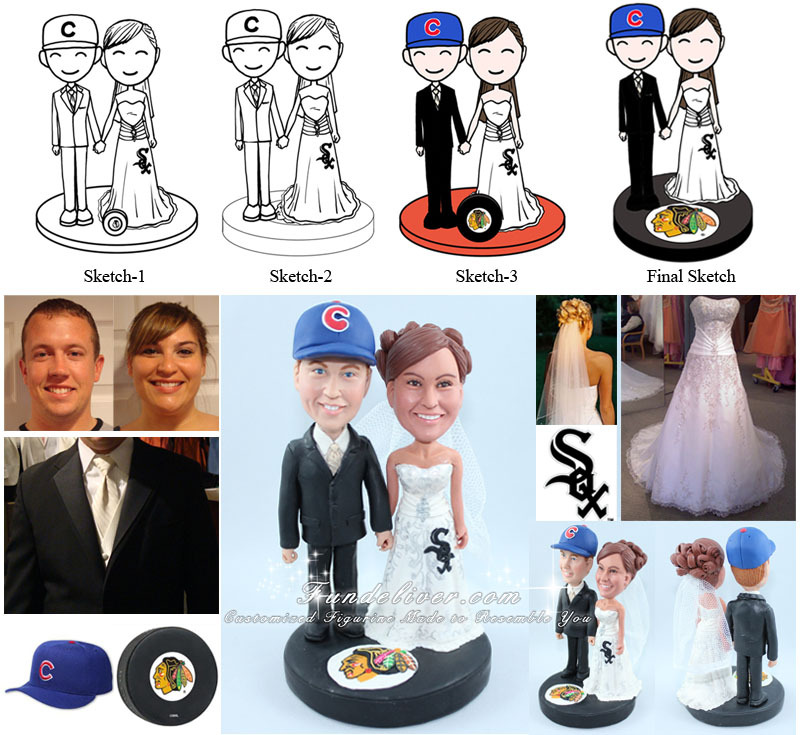 We still have other Chicago White Sox Cake Toppers and Chicago Cubs Cake Toppers, don’t forget to enjoy them, have fun.